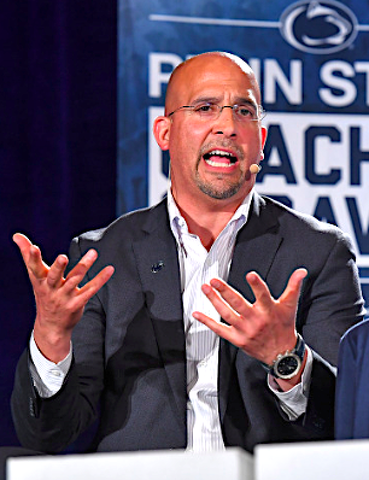 Initially with head football coach Bill O’Brien and athletic director Dave Joyner, then followed by current coach James Franklin and vice president for intercollegiate athletics Sandy Barbour as the headliners, the tour also featured a multitude of Penn State head coaches. Mainstays included a trio of legendary PSU head coaches — Russ Rose of women’s volleyball, Cael Sanderson of wrestling and Char Morett-Curtiss of field hockey — as well as leaders of the Penn State Alumni Association, a tour co-sponsor. In its six years, the caravan covered 69 stops and 8,588 miles over 45 days. The caravan was the most rigorous in its initial year, when O’Brien & Co. made 18 stops in seven states and Washington, D.C. over an 11-day stretch that covered nearly 2,000 miles. In 2014-15 — his first two years at Penn State — Franklin headlined caravans that made 29 total stops over 21 days, while covering nearly 2,500 miles. Since its inception, the tour typically started the end of April or the beginning of May, and covered three weeks in 2012. The tour was on hiatus in 2016 and when it resumed in 2017 — after Penn State football’s Big Ten championship season — it was much more limited in scope. In 2018, the caravan made three stops (in New York, Philadelphia and Washington, D.C.) over three days. In its seven years, the caravan’s focus changed from alumni and fan relations to more of a fund-raising emphasis. Most of the stops featured a season with fans and alumni, as well as a media opportunity that has the coaches and Barbour interacting with local media and a few Penn State beat reporters who followed the caravan from stop to stop. There is no word whether the caravan will resume in 2020 or if last year was its final trip. I reported on dozens of stops from the caravan, beginning in 2012 and finishing with the final stop in 2018, in Washington, D.C. where Franklin spoke to a room of just five reporters — all of them from Pennsylvania (a sign, perhaps, that the caravan had outlived its utility). My favorite story to come out of the caravan was in May 2015, when Franklin shared his very personal story of his Pittsburgh and southern roots, as well as his family history, when he told an insightful and heart-warming story about why he’s known as James and not Jim. Read it here. For my list of the top quotes to come from the caravan prior to 2018, click here.